Welcome to my first ever blog entry! Even with the massive number of cookbooks in my collection, it was a no-brainer on which one to select for the first entry. 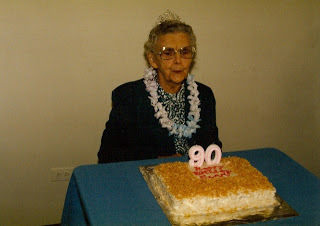 Since today would have been my Grandmother’s 113th birthday, I wanted to honor her. 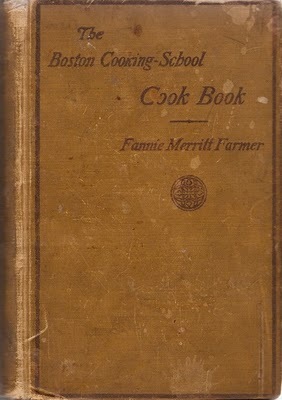 I have in my possession the classic Fannie Merritt Farmer cookbook, “The Boston Cooking School Cook Book,” first published in 1896. My Grandmother’s edition is from 1914, which means she bought it as a young college student. Inside on the second page she has written: Pauline Rose, 2205 College Street. Since she went to school in Cedar Falls, Iowa, I assume that was where she bought it. How I would love to know what she cooked from the book. Grandma attended a teacher’s college, as they were known back then, but she did take Home Economic courses. One of her cooking teachers was aptly named Miss Pancake. No joke. Those of us who love to cook owe much to Miss Fannie Merritt Farmer, who helped to standardize the system of cooking measurements as we know them today. In old cookbooks, measurements were written as “a piece of butter the size of a walnut,” or “a teacup of milk.” Farmer decided one should have accuracy in cooking, which is why she came to be known as “the mother of level measurements,” such as the teaspoon and the cup. Miss Farmer also believed in pretty food presentations, such as cutting bread into heart shapes and placing it on a delicate flowered plate. She felt it just made people feel better about eating, and about healing them if they were ill. Miss Farmer also educated the world on food science, nutrition, sanitation, household management, convalescent cookery, and, of course, techniques of cooking and baking. One of my favorite stories about Miss Farmer concerns the time when she inquired about getting her cookbook in print. Publishers were very leery of taking on a business venture designed by a woman, and insisted she pay all the initial printing costs out of her own pocket. Because of this chauvinistic attitude, she insisted upon retaining all the copyright and profits. Guess she had the last laugh! This first blog written with admiration for Fannie Farmer and with love for my grandmother, Pauline Rose Lamb, who taught me so much about the joys and rewards of cooking from the heart. A day rarely goes by where she doesn’t enter my thoughts. Happy birthday, Grandma. Debbie I so enjoyed reading your first posting on your cooking blog. I had not realized that Fanny Farmer was responsible for the standardization of measurements. I recognize the importance of this when I try to duplicate some of my mother’s recipes that call for a “handful” of some ingredient. Will you be doing this daily? Keep me in the loop. Good luck girl! Great first entry and best of luck with your new blog. This book has been a cooking Bible in our family since someone gave a 1941 copy to my father as a joke. Fanny knew her way around a home, especially the kitchen. We all love this book, all the recipes hold up to modern processes and ingredients. Super rhubarb pie! Thanks for writing, Mary Lynne. I’ll have to go check out the rhubarb pie. Funny story about your dad! I am so touched that you are going back to read each blog. Since I started writing it over eight years ago, I switched over to Word Press and in the transition, the format is different and I lost some photos. One of these days, I will go back and fix the old blogs. Thank you for being one of my loyal followers!